Am I the only crazy mom who has a junk closet? 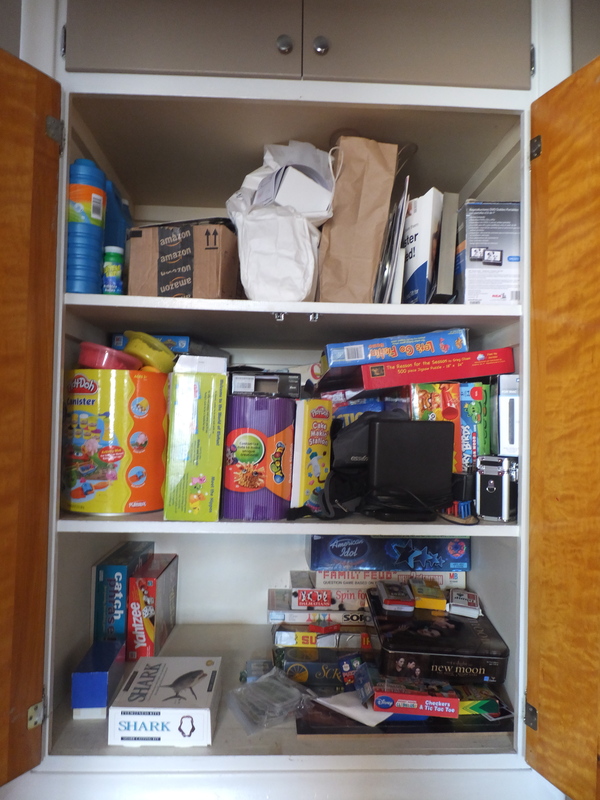 A closet so full of games, puzzles, crayons, stickers and other junk that if you want to put anything away you have to shove it in and hurry and slam the door before it all tumbles back out at you? Please tell me I am not alone in this. The closet in my hallway is my junk closet. It is crammed full of fun activities that I can’t even get to. Fun stuff that I can’t even find. I couldn’t take it any longer. I took several games to play at a family overnighter. When I got back and opened my game closet I didn’t even want to put them back. There was no room. I was depressed at my own filthiness. Am I the only mother who gets behind on her organization? Am I the only one who gets tired and occasionally just shoves stuff away instead of putting it in the right spot? 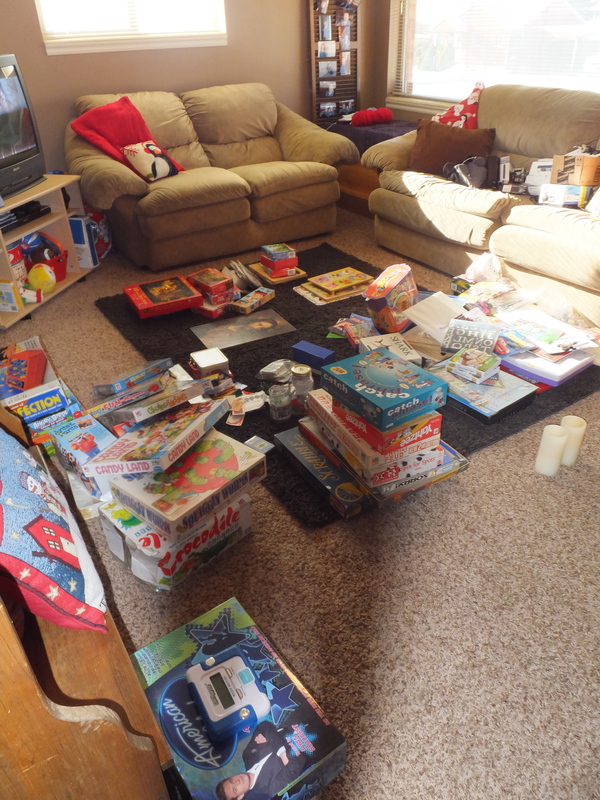 I let our games sit in the corner of my living room until I got up the courage to sort my way through the crap in the closet. And when I finally did it took all day. I started by getting everything out. Then I sorted through the different types of things. I put games in one pile, puzzles in another etc. Then I got to the random, miscellaneous items that I didn’t know what to do with. I am embarrassed to say that I had 12 bottles of bubbles stowed carefully away in my closet. Twelve! 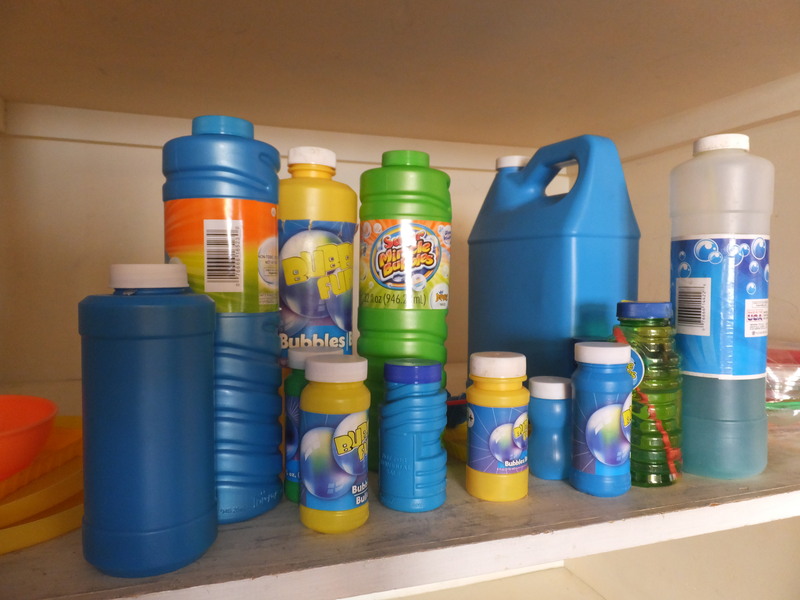 I’m sure I had that many because if I glanced quickly at the closet I couldn’t see any bubble bottles. That’s because they were hiding behind other useless things. It would take us 5 years to go through all of those bubbles. And don’t even get me started on the crayon boxes. I think we had enough 24-piece crayon boxes in there to send one with my boys to elementary school each and every fall. And my boys don’t even like to color. There were games in there that we have never played. I put those in a different pile – a donation pile. I know there was stuff in there that I haven’t seen or used in years. You should have seen my 18-month-old. He was in heaven during the big sort. Mom was the one making the giant mess this time. He got to look at and play with everything and he didn’t even get in trouble. After sorting everything I started to put it back, but I did it differently this time. Instead of stacking my games I stood them on their side. That way if we want to play on we don’t have to get out six or seven at a time. Why didn’t I set it up like that 8 years ago when we moved here? Maybe now we can play Candy Land or Chutes and Ladders again. I took an ice cream bucket and filled it with crayons. Then I went through every single one of our markers and tested them. About half of them went in the garbage. The other half went in another ice cream bucket. I did the same for the pens and colored pencils. Now each and every one of our writing utensils actually works. I sorted all of our small games that didn’t have boxes into their own Ziploc bags. Then I put them in a basket with our card games. Now they aren’t shoved away in the corners catching dust. The end result turned out great. I feel like I did it. And if I can do it, anyone can. It probably won’t last. The junk will creep back in and my laziness will overcome the organization, but for now it feels good. And it looks good. And we can finally have fun with our games again. I found this creepy worm while trying to bottle pears. You can see its disgusting, wriggly body in the left center of the picture. Would you like a few worms with your freshly bottled pears? Neither would I. That is why I ended up chucking an entire half-bushel of Bartlett pears. I should have known. When I saw an online ad for pears that were half the price of any place nearby. That was a red flag. When I drove into the heart of a broken down city scrambling to find a rundown home on the side of a dirt/gravel road I should have suspected. That was a red flag. When the guy insisted on cash only. When he mentioned that he doesn’t spray his trees because likes to grow his pears “organically.” When he told me it was his first year selling. Red flag, red flag, red flag. But I was so proud of the fact that I stumbled upon a great deal, I was blinded by the price tag. I should have paid $10 more and got a box of beautifully sized worm-free pears. But I didn’t. I called the number of the online ad, drove to a shady part of town, picked up my pears and a week later busted into three of them only to find three small, peach colored wriggly worms staring back at me. I could have dealt with one worm. Maybe even two. But by the time I saw the third worm I was ready to throw up. 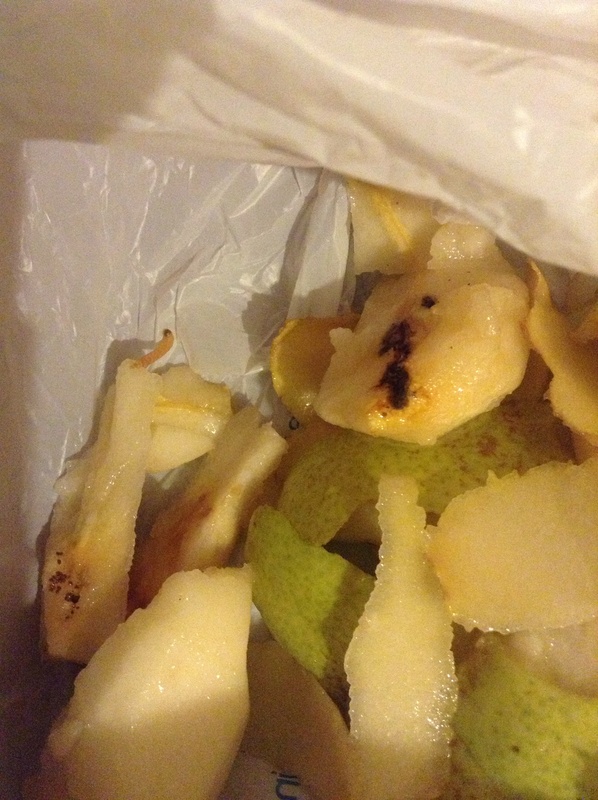 I quickly dumped all of the pears into a plastic sack and made my husband toss them in our outside garbage can. 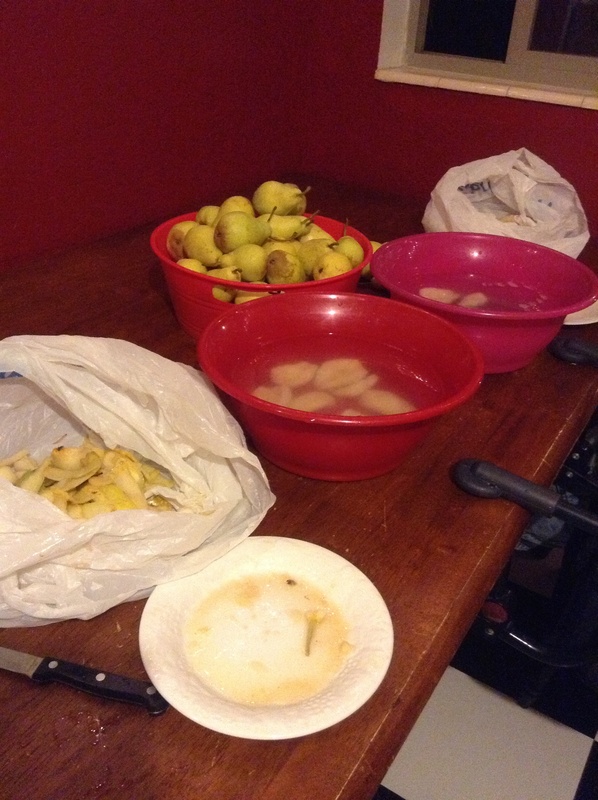 I was all set up and ready to whip out several bottles of beautifully white, halved pears. I went to bed pearless. I was sad. My husband was happy. That meant he didn’t have to help me peel, core and bottle a bunch of pears. I swore off bottling pears and decided to buy a case of cans of pears to get us buy this year. There’s no way you can get me to cut open another raw pear for a long time. I should have forked over a little more money to get a quality product. Sometimes my frugality leads to bigger problems. Next time I’m going to a well-known fruit stand. Somewhere I wouldn’t be scared out of my mind to go back to and get a refund if the pears were worm-infested. Somewhere that is highly unlikely to have wormy pears to begin with. To heck with saving a buck next fall, I’m going somewhere I can trust. Pieces of potato that I picked out of the bottom of my oven. Just when I think I finally have a handle on how to cook for my family, I blow up a baked potato and find myself on my hands and knees scraping off veggie shrapnel from the far right corner of my oven. Seriously? How hard is it to bake a potato? You wash it, poke it a bunch of times with a fork and viola! It’s ready to toss into the oven. I’ve done this a million times. Well apparently this time I missed poking one last week – or I only poked it half as many times as I should have. Because while I was waiting for dinner I heard a loud boom and peeked into the oven to find that one of the potatoes was hollowed out with it’s insides shattered in a million pieces on my oven floor. The best part? 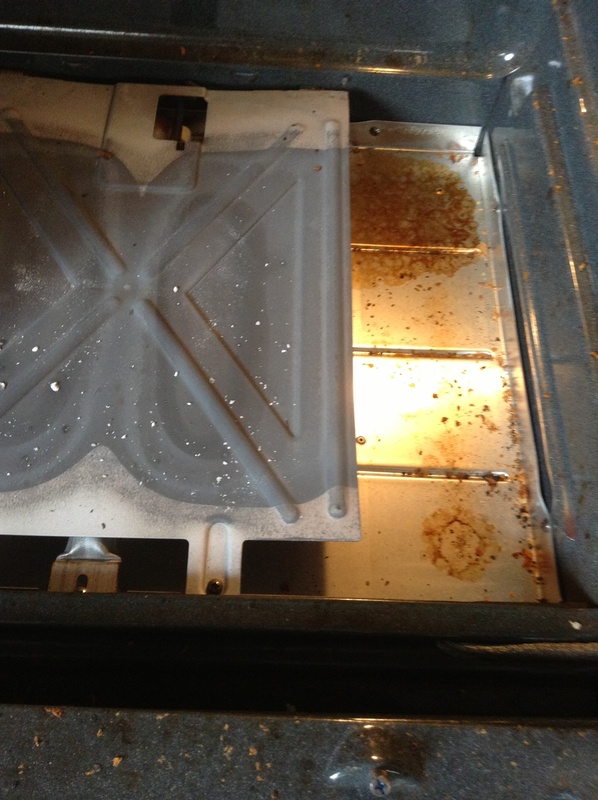 The oven was too hot for me to clean up the mess and I forgot about it for several days. It wasn’t until I started smelling some serious charred food while preheating the oven a week later that I remembered the potato pieces. Unfortunately the oven was too hot to wipe out so I found myself carefully wrapping my hands in hot pads and scraping out as much of that poor potato as I could. Then I started preheating it again. All the while hoping that I didn’t set off the smoke detector – something that happens frequently around here. The corner of my oven where a potato exploded last week. When your husband walks in from work, takes one whiff of the kitchen and asks if we need to go out to eat, you know you have failed as a housewife. 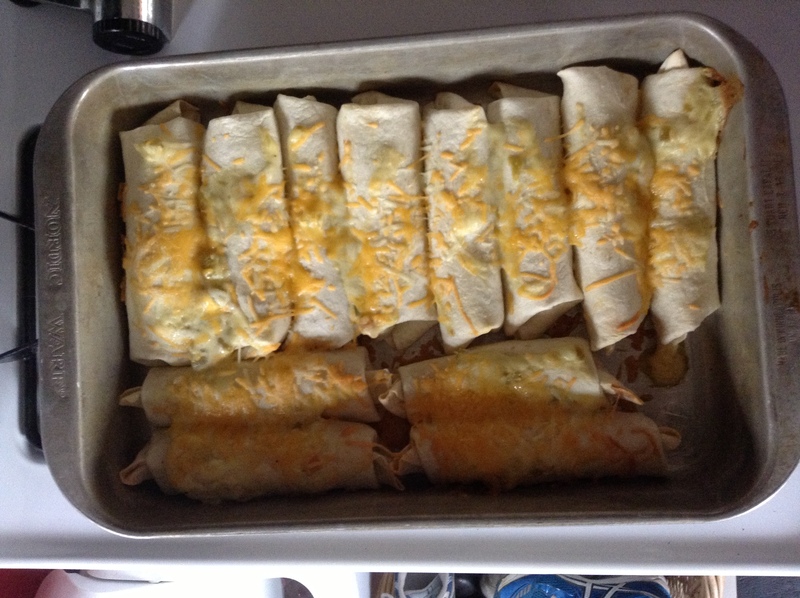 Luckily, the enchiladas turned out just fine. We may have eaten dinner a little later than normal, but we did eat a home cooked meal. I think I have shared this recipe before, but just in case, here it is. If I can cook them, anyone can. I’m all about easy recipes. But then again I thought baking potatoes was easy. Guess again! Take some sour cream and the can of cream of chicken soup and combine them in a bowl. Add milk until it’s creamy. Then add the can of green chilies and onion. Take a tortilla, smooth a spoonful of the creamy sauce in the middle. Then sprinkle a handful of chicken and cheese on top. Roll into a burrito shape and put in a greased cake pan. Repeat until almost all of the creamy sauce is gone. Save about ½ cup. 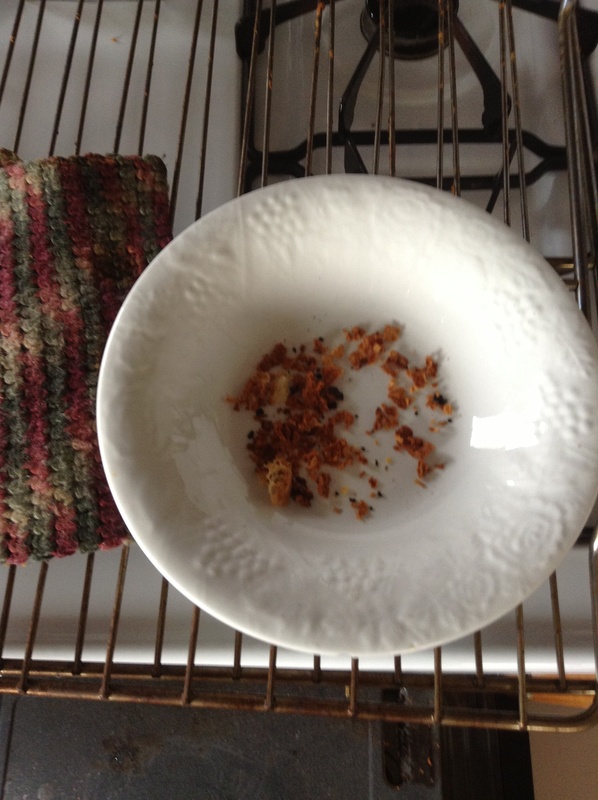 Smear the saved ½ cup over the top of the burritos. Sprinkle with a little more cheese. Then bake at 375 degrees for about 45 minutes. 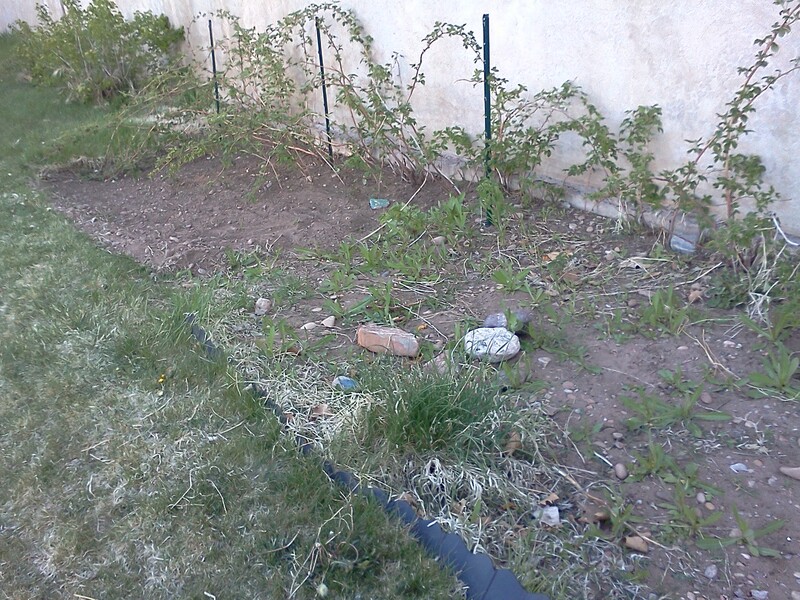 Here’s my half-weeded garden. Anyone who knows me will know that this is driving me nuts. I love to garden and I hate when I don’t finish projects. But, I haven’t had time. Oh well, right? My children have been motherless for the past month. At least it feels that way to me. I have been running around like a chicken with her head cut off. Between sewing projects, bathroom remodels, taking a small part in my sister’s wedding festivities, sporting events, church meetings, book clubs, etc., I have been running around ragged. Don’t get me wrong, I want to do all of these things. I choose to do all of these things – I love socializing and helping others – but it feels like it’s been a jam-packed spring. Easter snuck up on me and now Mother’s Day is almost a week away! Where has all the time gone? My poor kids have had to fen for themselves as I have spent a vast majority of my spare time working on a million different projects. For the past month I have been a missing-in-action mother. I am sure that my children don’t mind that they have watched extra television and played long hours with the neighbor kids. They probably don’t even care that we haven’t read 20 minutes every night or flossed their teeth every day. But it’s starting to get to me. My garden is half weeded, my house is half clean and my basement bathroom is halfway remodeled. My kitchen floor is nasty, there are baby treats smashed all over my van and we aren’t even going to mention my laundry room turned dumping pile. It’s so jammed full of crap I don’t even know where to begin. My basement storage room flooded about a month ago. 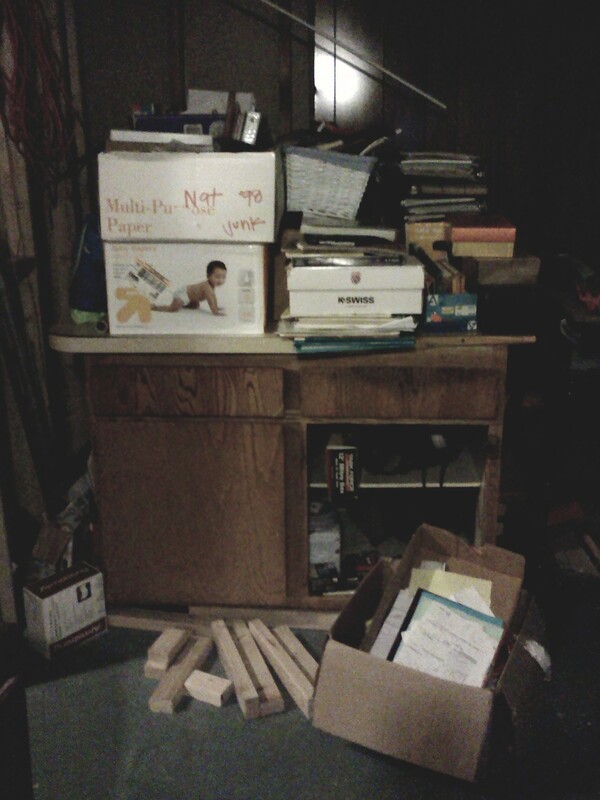 I had to take all of my boxes and papers and move them into the laundry room. They are still sitting in this pile today. I know I need to get rid of a lot of it, but haven’t had time. Hopefully I will have time to sort through them soon! Ironically there are times in my stay-at-home life that I am so bored I want to cry. But not lately. What do you do when you are so busy you can’t think straight? I miss relaxing with my boys while watching PBS in the afternoons. I miss building Lego sets and spying on enemies in the back yard. So I say who cares about the kitchen floor and the laundry room? During these busy times we are just going to have to stick to the linoleum and shut the basement door. If I don’t have time to do all of my projects, clean my house and play with my kids, I choose to give up on the cleaning. It can wait until one of those days I am bored to tears. That’s when I’ll sort through the debris and mop my floor. I don’t want to be missing in action any longer. I want to cuddle to my boys while we read stories on the couch and huddle with them under their army fort while we make plans for war. 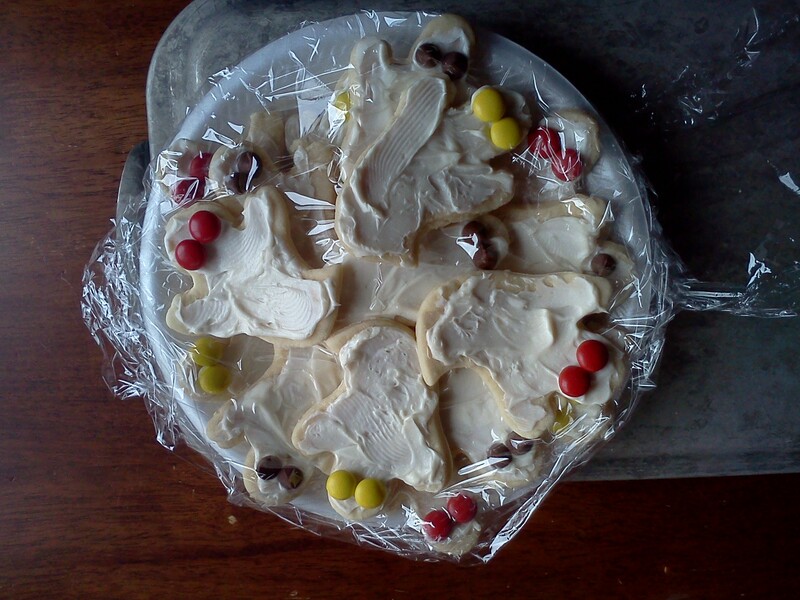 I am never making another gingerbread man. Ever. I tried to do something nice and fun with my kids and it backfired. Apparently I promised my oldest son that I would make gingerbread cookies with him Saturday night. The same night my husband was gone to a church meeting, my boys were going to a basketball game and I had to speak at a local event. Somehow that promise had slipped my mind. So I found myself trying to whip up some last-minute cookies to keep him from flipping. First of all, let me say that the ingredient list for gingerbread cookies is not for the amateur chef. I’d like to know who has molasses, ginger and cloves readily on hand. Let’s just say that I don’t. My neighbor doesn’t either. But she had something even better. A Betty Crocker gingerbread cookie mix. One egg and ¼ cup water later and we were ready to roll. We threw several “men” into the oven and they were finished just as we were ready to leave for the night. My boys didn’t get home until late and went straight to bed. Magically, in the middle of the night, two of the gingerbread boys disappeared. The next morning I thought they would be thrilled that their creations had come to life, but my 6-year-old was far from thrilled. He was horrified. First of all he was mad at me that I let the gingerbread escape. As if I had any control over it. He wanted to run the streets of Roy searching for him. Secondly he was even more upset that part of his gingerbread (he thinks a leg, I think a head) had fallen off when the little guy “hopped” away. Somehow part of him was lying next to the pile of crumbs on the cookie sheet. How part of that gingerbread boy got left behind, and how he could run away without his “leg” or “head,” I will never know. Oops! My oldest spent all of Sunday afternoon searching for footprints in our yard and building a trap to catch the remainder of the gingerbreads – A trap that required string, tape, fabric, etc. – A trap that tied to my oven and left a big mess in my kitchen – A trap that I made him take down. I tried to convince him that the gingerbreads that were going to escape had already escaped. We compromised. Now I have a pyrex glass container filled with gingerbread men sitting on my stove, covered with two bandanas tied extra tight. I tell you, you try to do something fun with your kids and it backfires. My son couldn’t be excited that we made magical dough. He had to turn into a gingerbread hunting, killing machine. It turns out, we don’t even like gingerbread cookies at our house. I don’t know how long those little men will sit trapped on my stovetop. The only reason my oldest wanted to make the stinking things was to see if they would escape. Go figure. I am so sick of crappy diapers. And I’m referring to quality, not quantity. I can’t tell you how many times in the past week my 4-month-old has leaked through his padded diaper. I am getting sick of it. When he was a newborn I used only the really nice Huggies and Pampers. But the past two times I have bought a store-brand box of diapers because, let’s be honest, they are half the price. But the consequences have been dangerous. I never know when I am going to be somewhere and pooh will seep through his shirt. It’s getting to the point where I might as well buy cloth diapers. I mean I have to rinse waste out his onesies anyway. I might as well strap a padded, cloth triangle to his tush. I will admit that recently I threw a onesie away because I was not in the mood to scrub it out. I was shopping with him late at night when it happened and I am not ashamed to confess that I threw that soiled shirt into a Wal-Mart trashcan. I know my other boys leaked through their diapers occasionally, but I don’t remember it being this bad. 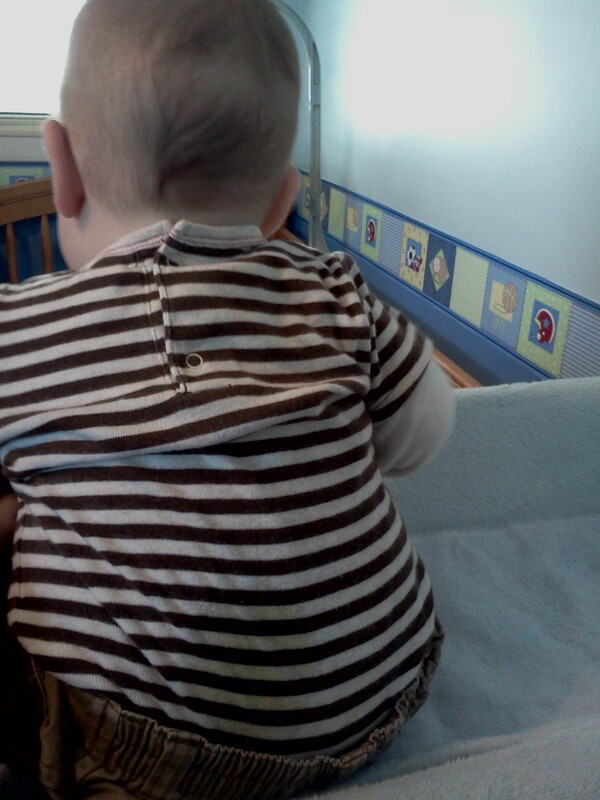 Maybe it’s because my youngest has several spare rolls around his middle, making the diaper difficult to cinch. But I just bought a big box of the next size up and they are still leaking. And no matter how tight I get it, these cheap diapers always seem to have a slight gap in the back. In my defense, I don’t wait to change him. If I know he needs to be changed I do it quickly – most of the time it is still too late. I guess I might have to break down and buy name-brand diapers again. It’s either that or keep on cleaning up crap. I just wish decent diapers weren’t so stinking expensive. For years I have spent a lot of time and money on building up my long-term food storage. No one ever told me I would never want to use it. I’m not saying I won’t ever need to use it, I’m just saying that after my cookies tasted like cardboard last week, it’s doubtful I’ll ever crack open another can. I had the thought recently that I needed to start rotating my stored-up food supply. I have cans of flour that I packaged at my church’s food storehouse that date back to 2006. Others I packaged at my home in 2010. Instead of buying fresh flour from the store, I’ve been opening cans from my basement and using what I’ve stored. I noticed that my baked goods have been coming out flat. I’ve had to add extra flour to each recipe to compensate. I can deal with collapsed cookies, but I just can’t stomach ones that taste just plain out nasty. Each Halloween our family makes ghost sugar cookies with M&M eyes. Last week, those poor ghosts tasted ghastly. I knew was something was amuck when the dough tasted a little bitter. But my two oldest boys keep asking for more samples and reassured me it was delicious. They must have no taste buds. After rolling out more than 60 ghosts, baking and then frosting them, I let them sit for the night. The next day, before I took the cookies to a Halloween party, I finally tasted one. YUCK! I told my husband I was going to trash them all and he let me. That’s when I knew they were bad. Making sugar cookies is hard work. I nearly cried when I had to dump the 5-dozen ghosts into my outside trash bin. I really think it was the old flour. My church encourages its members to have a well-established food reserve to draw on in times of natural disaster or personal crisis. I’ve been trying to slowly grow our hoard. I can’t imagine not being able to feed my little family if we fall on hard times. But I am going to have to do some research and try something else when it comes to flour storage. I may end up purchasing a wheat grinder and canning wheat from now on. But who know what that type of diet will do to our tummies if we ever have to use it. And who knows what I am going to do with the dozens of #10 metal cans filled with musty old flour lining the shelves in my basement. It sickens me to think that I’m not going to want to cook with any of it. Not even in a disaster – or personal crisis. Then again, maybe it won’t matter if I am starving. Maybe cardboard tastes loads better when your stomach is empty. What’s in your long-term food supply? Have you had any success cooking from food storage?